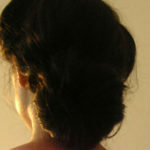 In this tutorial I’ll show you how to make a basic Edwardian Pompadour hairstyle. This 1910 Pompadour updo is described as ‘chic and pretty, without being in any way over-elaborate’. ‘The Pompadour style is one of the quickest methods of dressing the hair’ (Every Woman’s Encyclopaedia, 1910-2): It can be done in less than ten minutes. First wave your front hair. 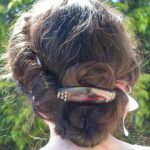 Here you’ll find my Edwardian pin curl tutorial. I’ve tried hair combs but they didn’t hold my hair. So I’ve secured the Pompadour roll with bobby pins which worked. ‘The most simple and speedy method of disposing of the foundation tail is by making a neat figure of “8.” […] This style […] is one which should prove of the greatest use to business girls, as it is chic and pretty, without being in any way over-elaborate.’ (Every Woman’s Encyclopaedia, 1910-2) Twist the ponytail till a loop forms – the bottom of the ‘8’. 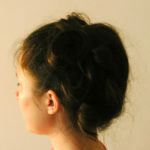 Keep twisting the ponytail and make a second loop at the top. Hide the hair-ends and secure the ‘8’ with pins. Lina, I have no talent for hairstyling – I’ve always said I have a hairdon’t rather than a hairdo! I’m great with historical cooking, but I better let someone else fix my hair. Lol! 😀 Thanks for stopping by, Jean! I find it distressing to see anyone who wears these types of styles always has thick hair…lots of hair. Mine is thin and unthick…and pulling the sides up reveal my scalp! So I can’t wear any up-dos! Waves are essential for this authentic Edwardian Pompadour hairstyle, either natural curls or the Edwardian pin curls (zig zag waves). 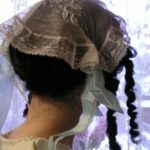 And Edwardian women often used false hairpieces or rats if they had thin hair. I’ll soon post more about Edwardian hair rats. Hello Lina! I wandered to this post from your link in your tailored skirt post ~ just lovely! I have longer hair but it is thin, like another lady mentioned. However, that being said, I do pin my hair up once in a while. I love all of these instructions and it’s cool that you found them from those old magazines!!! Are they online? Or do you collect old ladies magazines? Yes, the old magazines are online: When you click on the links in the post, it takes you to the Every Woman’s Encyclopaedia where I found the instructions. So delighted to find this website as I am a Townsend and Son’s fan. Thank you so much for the hair do instructions. I will make it if I ever get up enough courage to put the henna I got on my gray hair.